The tendons, ligaments and muscles surrounding a joint are what give it strength and stability. Ligaments and tendons are tough fibrous bands. Ligaments attach bone to bone, tendons attach muscle to bone. The anterior longitudinal ligament (ALL) and the posterior longitudinal ligament (PLL) run the entire length of the spinal column. 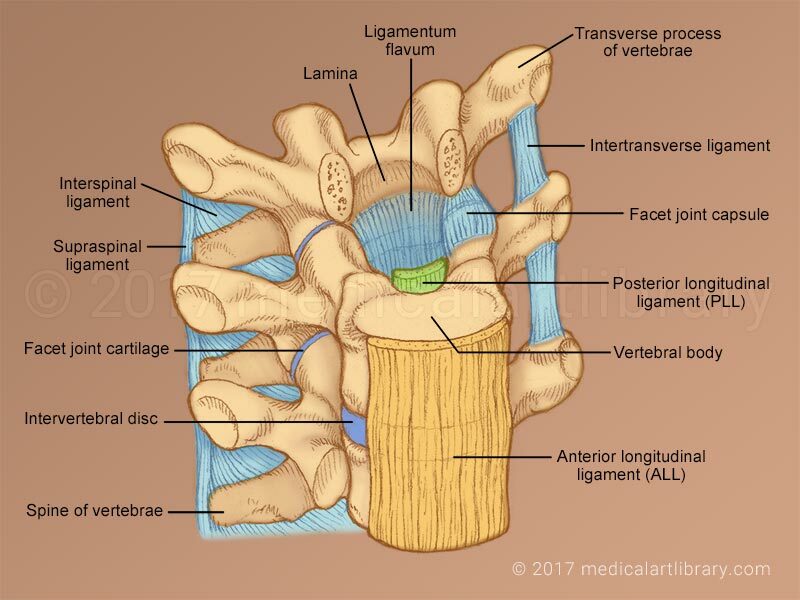 The anterior longitudinal ligament attaches to the front of the vertebral bodies and the posterior longitudinal ligament to the back. Both the ALL and the PLL support (and attach to) the intervertebral discs. These ligaments strengthen the discs to help prevent herniation. The PLL becomes narrowest in the lower lumbar region where the majority of disc herniations occur. The ligamentum flavum extend from one vertebral lamina to the next inside the vertebral canal. They form the roof of the canal in the gaps between the boney vertebrae and may be pierced during lumbar (spinal) puncture. They blend with the facet joint capsules laterally and with the interspinal ligaments posteriorly. 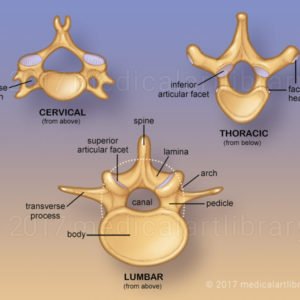 The supraspinal ligament and interspinal ligaments extend from one vertebral spine to the next. In the cervical region the supraspinal ligament becomes the ligamentum nuchae.